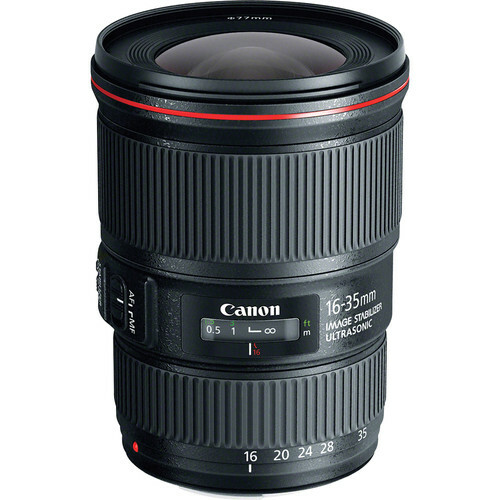 The Canon EF 16-35mm f/4L IS USM Lens is a wide-angle zoom lens featuring a constant f/4 maximum aperture to provide consistent performance throughout the zoom range. The optical design incorporates three aspherical elements, including one large-diameter aspherical element, as well as two UD (Ultra-low Dispersion) elements to minimize chromatic aberrations and contribute to high edge-to-edge sharpness and resolution. A fluorine coating has also been applied to the front and rear lens surfaces to reduce flare and ghosting for maintained color neutrality and image contrast. Benefitting working in difficult lighting conditions, an Optical Image Stabilizer has been integrated into the lens design to minimize the appearance of camera shake by up to an effective four shutter speed steps. For fast, smooth, and near-silent autofocus performance, a ring-type USM (Ultrasonic Motor) AF motor is employed and benefits from an internal focusing design to maintain the overall length of the lens during use. Full-time manual focus override can also be utilized for fine-tuned focusing precision as closely as 11" throughout the zoom range. Â When paired with an optional Protect filter, this lens also exhibits a dust- and water-resistant construction to enable its use in inclement conditions. Wide-angle zoom L-series lens is suitable for use on both full-frame and APS-C sensors (where it provides a 35mm-equivalent focal length range of 25.6-56mm) and features a constant f/4 maximum aperture for consistent performance throughout the zoom range.Two UD elements and three aspherical elements, including one large-diameter aspherical element, have been incorporated into the optical design to minimize aberrations and distortion throughout the zoom range.A fluorine coating has been applied to the front and rear lens surfaces to reduce ghosting for maintained image contrast and color fidelity.An Optical Image Stabilizer helps to minimize the appearance of camera shake by up to four stops for improved usability in difficult lighting conditions.A ring-type USM AF motor, along with an internal-focusing design, realizes fast and accurate focusing performance.Full-time manual focus permits critical focusing precision, even in AF mode.When an optional 77mm Protect filter is used, the lens realizes dust- and water-resistance for use in trying environmental conditions.A nine-blade circular diaphragm helps to produces an aesthetic out-of-focus quality.